Breakfast with Omi Marga. The table is set, the coffee pot is kept warm by a candle, the orange juice has been squeezed, the brodchen have been cut, the sun is hot, and the photos have been taken. 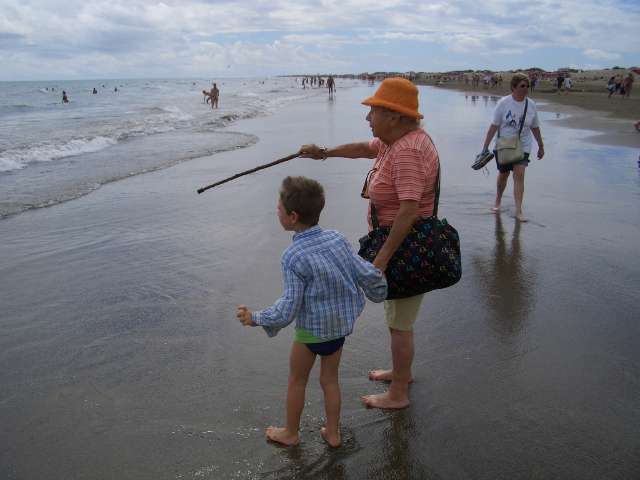 We head down the Avenida de Alfereces Provisionales to the Playa del Inglés beach. A choppy wind is coming from the east, from Africa, keeping the beachgoers alert, adding and subtracting clothing as the sun play hide-and-seek behind driven clouds. Isaac and Omi Marga walk ahead of us in the surf, holding hands, whilst Lila digs her face into my neck, escaping the breezes. Rose is prepared for everything; our stroller has a change of clothing, towels, water and snacks, sunscreen, and - courtesy of Omi - bocci balls. Lila falls asleep on me. 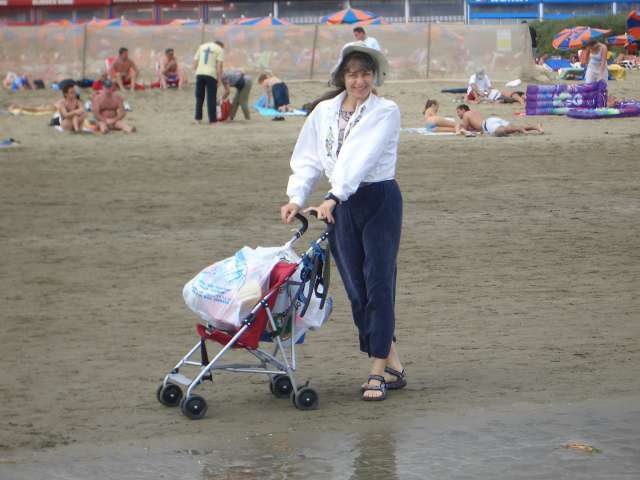 As she really needs the nap I leave the others to their adventures in the surf for the windbreak of the promenade. I want a place to sit with Lila, to sip a caffè con leche, perhaps to have a tiny lunch. But where to go? Most of the places cater to the tourists, and I'm not really in the mood for a wienerschnitzel. On one of the access walks, almost hidden in-between the restaurants, arcades, bars, and souvenir stands is the Burger Treff (German: burger meeting spot). Serving bocadillos filled with things like strips of veal, salat con atun y huevos, here is a place like those where I've seen local workers and taxi drivers eat. The food is tasty, simple, inexpensive, and the cook is attentive and smiling. What's not to like? A happy recomendation. After three-quarters of an hour Lila awakes, and we reunite with the others, already playing at the climbing structure. After a few hours on the beach, we head back up the hill, stopping by the Bakery Ziph for some too-many-to-count-grain bread for Omi Marga. It's surprisingly warm, and so the kids spend time in our kiddie pool. It's a light dinner with Omi Marga, and then over to the children's playground at the C. C. Yumbo". 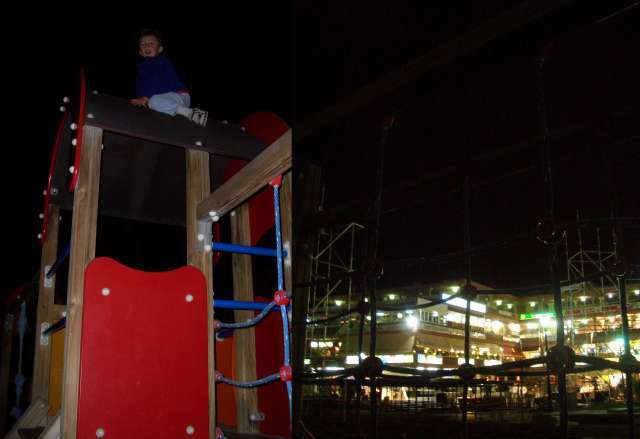 This strange with-and-without camera flash panorama lets you see Isaac atop the climbing area and the restaurants and bars behind, brightly lighted in the night, filled with tourists cowering at the threat of some rain (which, as it turns out, never comes). 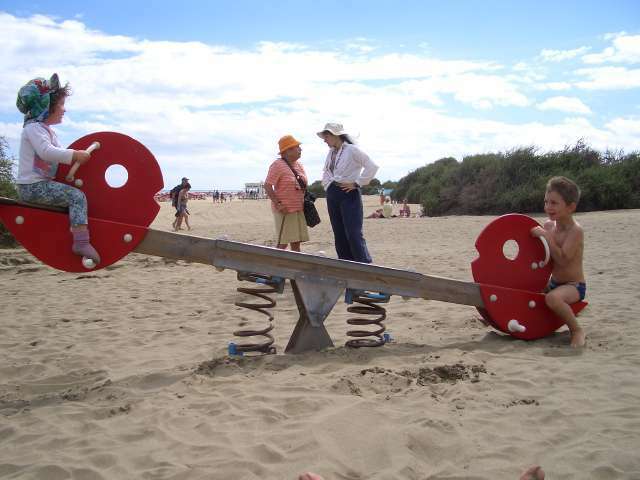 Tomorrow, the mini-tren ride around Playa del Inglés.